A tough decision – something a lot of us have to make one time or another. Now I hate to talk about my experiences with depression a lot; I do not want that to be the only example through which I can relate to you on a lot of issues; however, in this instance, well my life now is what it is and having a depressive episode a major one, has challenged me to make a lot of hard decisions. Before, my episode I was utterly clueless to the ways mental illness actually affected someone with the exception of my Baba who is a paranoid schizophrenic. But the thing is, there are many types of schizophrenics, many different types of anxieties, and depressions and each illness experience, although perhaps sharing some similar symptoms. is unique to each person. Have you ever thought about that, how does it actually feel on the inside to be mentally ill? The other concept I did not understand was how ‘physical’ depression can actually be. Your body can literally, be “physically” depressed and not just your emotions. Your mind can be physically depressed – which means you man not even feel sad but physically your brain is still affected by the depression. My episode was three years back, but I continue to be especially physically affected by it both in my energy levels and ability to concentrate and have mental endurance to do activities for long periods of time. My struggle to live a normal life with depression has lead me through a sizeable amount of prescription drugs. Sleeping pills because I cannot sleep on my own anymore, antidepressants, antipsychotics, and stimulants. Each drug I have tried with the exception of the ones I perhaps, had to go on when I was first very ill, have been tough decisions. Now you make think a little pill, well, is just a pill but it is not. Ever watch those prescription drug commercials on TV and ever notice the wide range of side effects each drug has? Those are the tough decisions when you are taking a medication, do the benefits of this drug out weigh the bad side effects? Now each drug I have continued to use I have continued to use on the basis that when I started to use it I felt somehow better. I do not always know exactly what that ‘better’ is but something just clicks, starts to feel better so I continue to take the drug because it helps. Nonetheless, I have tried many medications that have not worked for me. I found that doctors and nurses cannot tell you exactly how a drug will affect you, truth be told, they do not know, particularly, in psychiatry I think but maybe it is that way with medication and physical illnesses such as cancer as well. So some drugs make you extremely sick. And although I may be encouraged to continue to try a drug that makes me feel awful, where life and death are not concerned, I do not believe it is worth it to keep taking that drug. When medication is doing you more harm then good, physically and mentally making you sicker, giving you bad side effects, and not showing you that glimmer of improvement that you would like to see, I believe that drug is not for me. Now I do not want people not to take their medications because sometimes the truth is, you do need a drug even though it makes you ill, but for me, in this case, drugs that make me feel really sick even if it has only been a couple of days, are not the medications for me. Such was my experience with Clozapine this last weekend. I have never felt so sick, not even from a bad flu, as this drug made me feel. After, two days I was done with it. Clozapine is supposed to be a ‘last resort’ antipsychotic and it was for me to. Typically, it may be used for schizophrenia but also in cases of depression or where a psychotic episode has occurred. 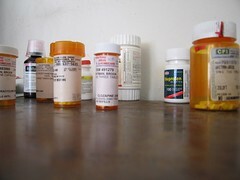 It was a difficult decision going on this drug – blood tests every week for the first 6 months and less often( for a longer period), a very good chance of large weight gain, and increased chance of diabetes, extreme tiredness, possible immunity disorder (hence the blood tests weekly), and other conditions having to do with the heart etc. The thing was though that, I had never tried this drug so it was a good option to try and Clozapine actually heals the brain a little bit every year, one of the only drugs in psychiatry to do so. Also, Clozapine causes you to sleep without the use of sleeping pills. For some people this is the ‘magic’ pill, for me it was not. I am comfortable with that decision especially given what that means. I have gone through so many medications that I am told by my doctor she does not know what to do to help me medication wise after this. I can function half normally on my current medications but not enough to work, to go to school full time. And suddenly, I am okay with that. I do not have a choice and I am fine. Someone somewhere may come up with a drug that may aid me in the future, but now I am at the limits of my doctor. And like a big weight off my shoulders when I decided I had enough with the Clozapine, I was okay with that. At least I can be stable, where I am at now. I know what I can expect this summer, in terms of what I can and cannot do. I still face many challenges such as my insomnia, and an energy decrease in winter months by a degree, but I know what to expect. And this brings me peace. Tough decisions, its hard to tell yourself you are okay with having a limited life, but it is also foolish to limit yourself. Many people suffer through many illnesses and bad times, and go on to do great things. Rather, than accepting my limits completely, I am learning to work around them to the best of my abilities and that is all any one could ask of me. I am blessed by God in the place I am at in life. It was not where I thought I would be, but I am okay with that. How about you? Are you okay where you are at in life? What tough decisions have you had to make?